After receipt, the sugar beets are cleaned and crushed first. Hereafter the sugar beet puree is transported to the Betaprocess where a reaction takes place under vacuum conditions at a temperature between 60 and 65°C. During this reaction the cells of the sugar beets ‘explode’. 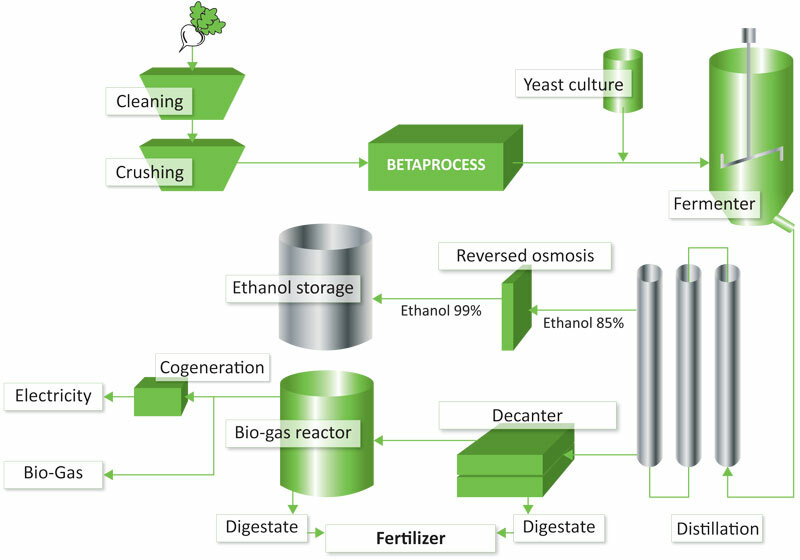 Hereby, the fibres, cell walls and cell membranes are ripped apart, so enzymes obtain direct access to the sugars needed for ethanol production. After addition of yeasts the material is pumped into the fermenter. After completion of the fermentation process the material is transported to the distillation unit. Due to Betaprocess it is not longer necessary to convert the puree to a juice, generating considerable savings on expensive equipment. Through distillation the ethanol is extracted and purified by reverse osmosis. Remaining residues are used for producing bio-gas and digestate can be utilized and sold as a fertilizer.